Your proposal is a losing proposal if it is driven by data, focused on the agency rather than people, highly technical and puts pricing on the last page. An expertly designed proposal makes use of a specific, winning formula based around facts, stories, processes and skills. 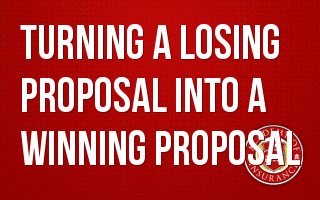 Hear the secret of turning your proposal into a winning proposal. How to develop a proposal that separates you from the "pack"